Thank you to all involved in the Allerford Music and Dance Festival and the related events in Somerset last weekend. We made a lot of new friends and shared our dancing, music and songs. Following a showing of the ‘Ballad of Shirley Collins’ on Friday evening, AVMM performed at the Festival on Saturday afternoon. We shared the dancing and music-making with the local community choir, West Somerset Morris and the Minehead Hobby Horse and followers. 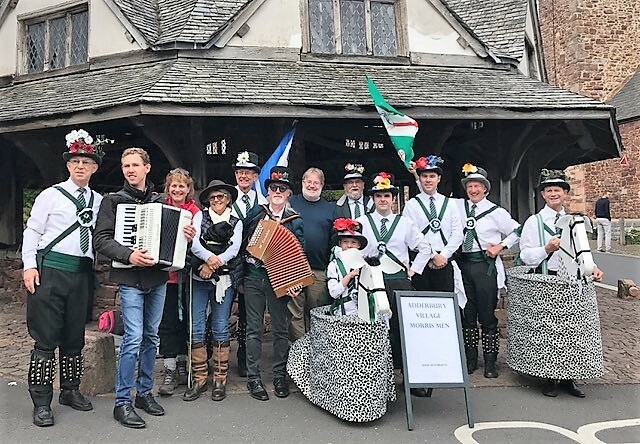 What followed was a great show of community dancing and singing followed by the first ever procession of the Minehead Hobby Horse through the village of Allerford accompanied by our own horses, dancers and musicians. 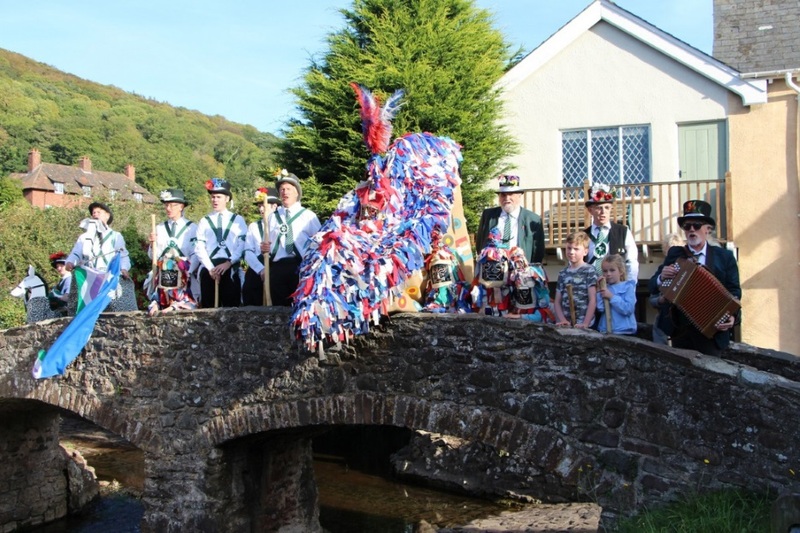 The singing of ‘Happy Man’ on the famous Allerford packhorse bridge with the Minehead Hobby Horse and Gullivers was simply magical. Sunday saw AVMM dancing in Minehead at the harbour followed by a short impromtu service in a wonderful Sailor’s Chapel. On to the historic village of Dunster with dancing next to the historic Yarn Market, with the towers of Dunster Castle in the distance. Well done all and especially Dylan, probably the world’s youngest Morris Dancer who can actually do all our dances. Everybody loved him and our wonderful dual horses – just like the pre-First World War side. Thanks to David Snell for restoring Charlie and making our new, small size hobby horse (‘Percy’). Thanks also to Graeme Horn and Lisa Eden from Allerford for organising this event and inviting us and guest accordion wizard Joseph Mallinson. Where next? The Hobby Horse festival in Banbury of course on the weekend of the 13th October.